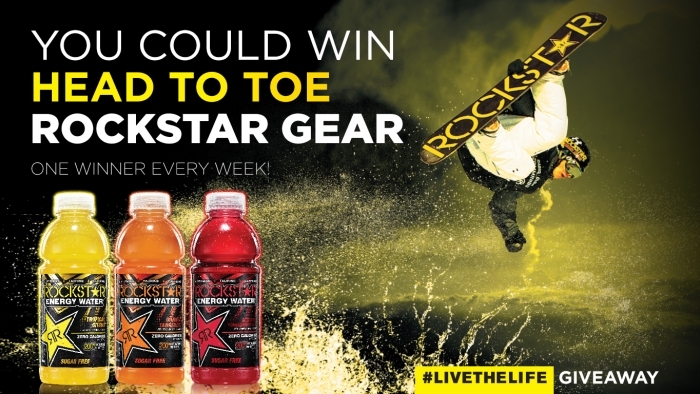 In national support of Rockstar Energy Water, Rockstar also announces the start of the #LiveTheLife consumer sweepstakes. #LiveTheLife will run March 1, 2013 through May 31, 2013. Consumers can enter online at http://www.rockstarenergy.com/livethelife or through Rockstar's Facebook page at http://www.facebook.com/Rockstar. Prize pack options are Skate, Snow, BMX, Moto, Surf and Music. Thirteen lucky winners will be selected, one each week throughout the duration of the sweepstakes. Energy Water available now at http://www.rockstarenergyshop.com.